I love the flavors of the holiday season. The tastes of pumpkin, cranberry, peppermint, and spice all take me back to memories of Christmas past. For me eggnog conjures up all sorts of holiday memories. I couldn’t get enough of it as a kid, and always looked forward to November when the fresh eggnog started showing up at the supermarket. These days I have to be careful how much of the rich beverage I consume, lest I lose my girlish figure over the holidays. Who am I kidding? I lost my girlish figure years ago! 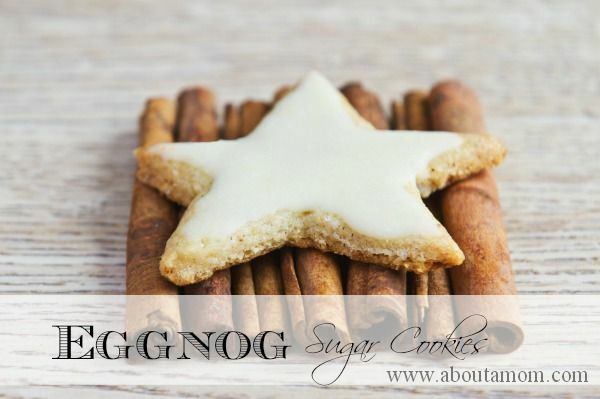 Anyhow, these eggnog sugar cookies are a treat any time of the year. Enjoy! In a large bowl, beat the softened butter for about 30 seconds. Add the sugar, baking powder, nutmeg, cinnamon, and salt. Beat until well combined. Mix in the egg and eggnog. Add the vanilla extract, and continue to mix until well combined. Slowly add the flour, about 1 cup at a time. Mix just until all ingredients are combined, scraping the side of the bowl if necessary. Divide the dough in half and form each portion into a disc. Wrap in plastic wrap and refrigerate for at least an hour or overnight. To bake, preheat the oven to 375 degrees. Line two baking sheets with parchment paper. Begin with one disc of the dough. Roll dough out onto a lightly floured surface to about 1/4-inch thickness. Cut the dough with a cookie cutter. Using a thin metal spatula, transfer the cookies to baking sheets. Bake for approximately 7-8 minutes, until the bottoms and edges are slightly golden. Transfer to a wire rack to cool. If desired, reroll scraps and repeat this process. Once cookies are cooled, whisk together the glaze ingredients in a small bowl. If necessary, add additional powdered sugar or eggnog to get the desired consistency. Using a small spatula or back of a spoon, spread the cookie tops with the glaze. Let the cookies fully dry. I love this recipe, but I wonder where one can buy eggnog when it isn’t that time of the year. Buy it during the holidays, & freeze it. Or, you can do a Google Search on recipes, I don’t remember where, but I think there is a homemade version you can do. These would be perfect for a party we are going to. Thanks for the recipe! I have never heard of this recipe and I am so going to make these for my friends they would love these.